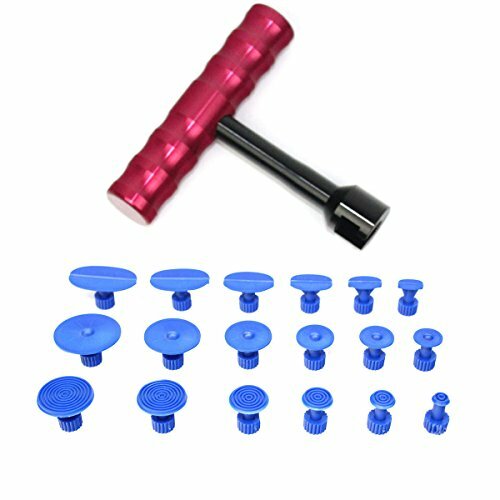 This item is a T-bar car dent repair puller with 18pcs puller tabs. It is easy to controll, suitable for any person to operate and repair the dent for yourself directly. Different sizes of puller tabs are offered to fit different dents. It will help repair the dent leaving no scratch or damage to your car body. - Size: Approx. 10 x 9.5 x 2cm/ 3.9 x 3.7 x 0.8 inch (L x W x H). - Works great on smaller door dings and hail damage. - Easy to controll, suitable for any person to operate and repair the dent for yourself directly. - Golf ball dimple design dent pulling tabs professional for autos body dent repair. - Repair the dent leaving no scratch or damage to your car body. - Fast, money-saving, and environmental tool for car owners. Works great on smaller door dings and hail damage. Easy to controll, suitable for any person to operate and repair the dent for yourself directly. Golf ball dimple design dent pulling tabs professional for autos body dent repair. Repair the dent leaving no scratch or damage to your car body. Fast, money-saving, and environmental tool for car owners.